Pavel Shugurov (www.33plus1.ru), Vladivostok, October 2011. 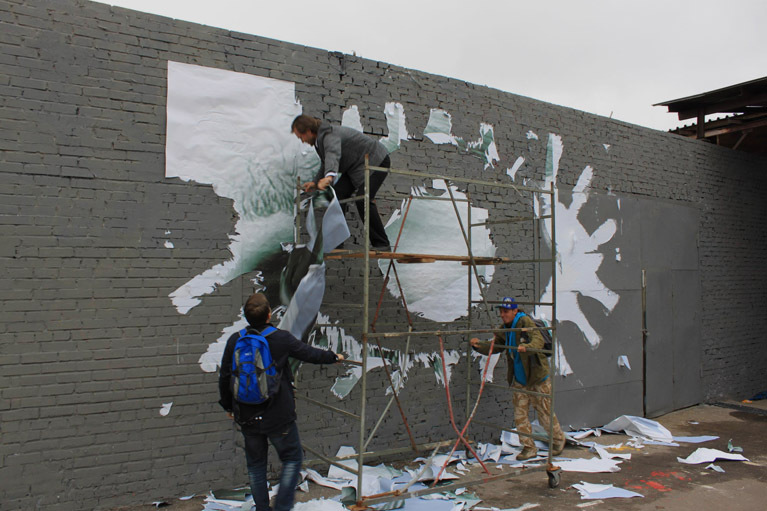 As many activists of other public art movements (for instance street-art and graffiti) muralist Pavel Shugurov doesn’t limit himself by creation of his own artworks. He makes program series “Walks in the City” about street art, urban environment and spontaneous communication, writes articles and manifestos, participates in lectures and organizes exhibitions and fests. As his latest “achievements” (allied but still very distant due to the tempo and subject-matter from the process of artworks creation) we can note his turning into a functionary of Vladivostok administration, rapid career development and parallel recovering the position (gone for a decade, nearly for good) of “the principal city artist”. Such versatile activity can’t but surprise, confuse the artistic occupations division protagonists, but still can’t but please. 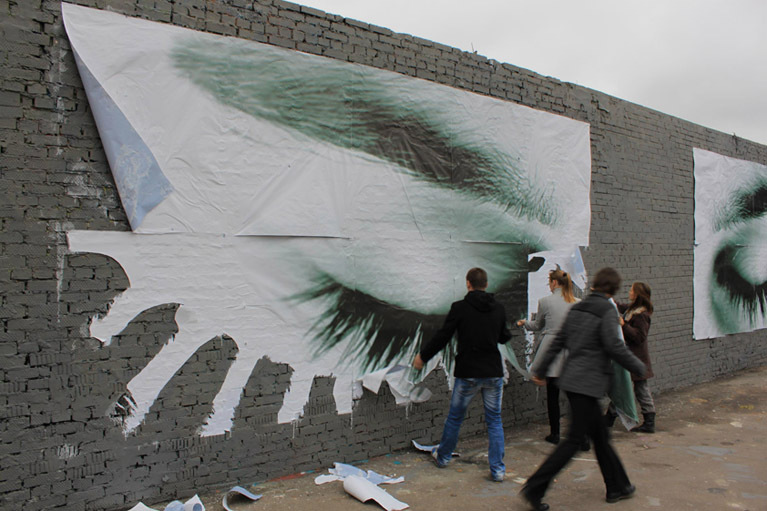 If the necessity of urban art isn’t admitted and appreciated, direct artistic statement isn’t supported and works of public artists are ignored and removed (Vladivostok isn’t an exception but a part of the common grievous rule) — who is to give a hand in organizing process and material support but the artist himself? Who is to return accessible and vital art to the city dwellers? Inviting all of the lecture attendants to become co-authors of the new “The Wall” layer the artist continues his series of interactive works (“Glue for the Bureaucrats”, “Cemented” and others). In a playful way the artist tries to illustrate a simple idea that only work and involvement help to open new meaning and to create new art. He also doesn’t exclude other interpretation of the composition (superiority of human labour to mechanical, wide format printing critics, sexual frustration of illegal ad peelers, total “cloudiness with sleep”, tunnel thinking, absence of artists’ and spectators’ will to see what’s going on around and so on).